Check out our robust trading platform, developed and supported by Rosenthal Collins Group. Stay up on all the news from Rosenthal Collins Group—from press releases to market commentary on Twitter and LinkedIn. Jul 17 2012 Rosenthal Collins Group initiates daily public posting describing its investment of customer segregated funds. 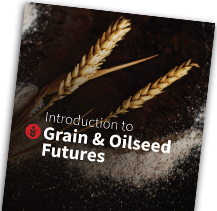 Grain and Oilseed Futures guide. Copyright © 2019 All market data is provided by Barchart Solutions.